After sifting through the up-and-comers, I knew I had to pick this one. 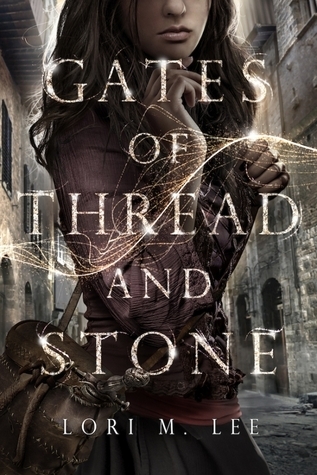 High fantasy, threads of time, creepy beginning referencing a Labyrinth? Mix well, squeeze out the instalove, and I'm sold. I'm hoping for a thrilling fantasy mystery here with a well-developed crush (because, let's be real, Avan is clearly going to be a crush) that avoids being instalovey and a lot of danger and family bonds. I'm also excited about the revolution part. The bit that scares and intrigues me most is the "threads of time" bit. What does it mean? What exactly can Kai do? Will Lee be able to avoid the perilous plotholes that come along with magical time abilities? I must know. Plus, I'm in love with the cover. The style is a sort of dimmer Cassandra Clare and I'm mushily in love with the font. I haven't read that one but I've heard mixed reviews. I've read some time travel books but the fantasy approach is very different. I'm curious. gorgeous cover! this sounds really interesting, great pick! This one sounds really good. I am all about covers and this one is beautiful. Def adding this to my TBR pile! Thanks for sharing! !